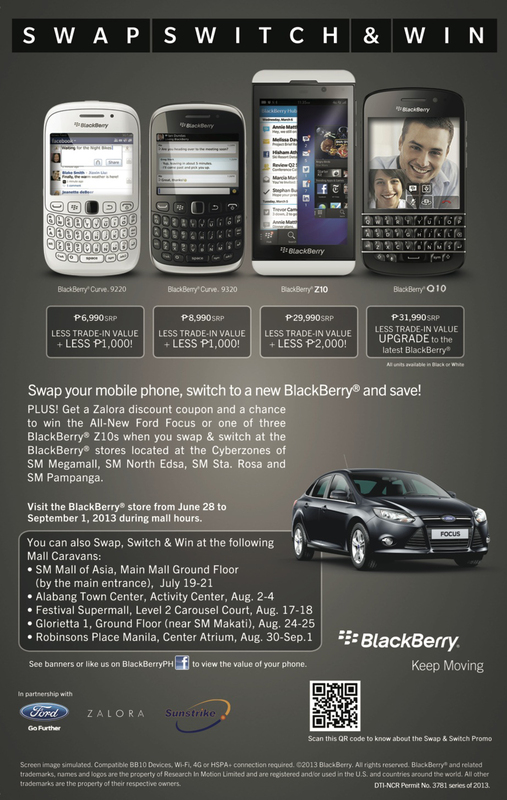 WEEKEND SWAP, SWITCH, AND WIN WITH BLACKBERRY | Where is Ed Uy? BlackBerry will also be bringing the fun to five more malls around the metro with the BlackBerry Mall Caravans. Be sure to drop by to Swap, Switch, and Win starting July 19 – 21 at the SM Mall of Asia, Main Mall Ground Floor (by the main entrance); on August 2 – 4 at the Alabang Town Center, Activity Center; on August 17 – 18 at Festival Supermall, Level 2 Carousel Court; on August 24 – 25 at Glorietta 1, Ground Floor (near SM Makati); and, on August 30 – September 1 at the Robinsons Place Manila, Center Atrium. •Get the BlackBerry Q10 smartphone, the first BlackBerry 10 smartphone to feature a classic BlackBerry QWERTY keyboard, at PHP 31,990 less the trade-in value of your swapped mobile phone. •Own the first all-touch smartphone to be powered by BlackBerry 10, the sleek BlackBerry Z10, at PHP 29,990 less PHP 2,000 and the trade-in value of your swapped mobile phone. •Have the compact and sleek BlackBerry CurveTM 9320 at PHP 8,990 less PHP 1,000 and the trade-in value of the swapped mobile phone. You may also visit one of over 300 participating stores around the country to swap and switch your working and non-working mobile phones for a brand-new BlackBerry smartphone. 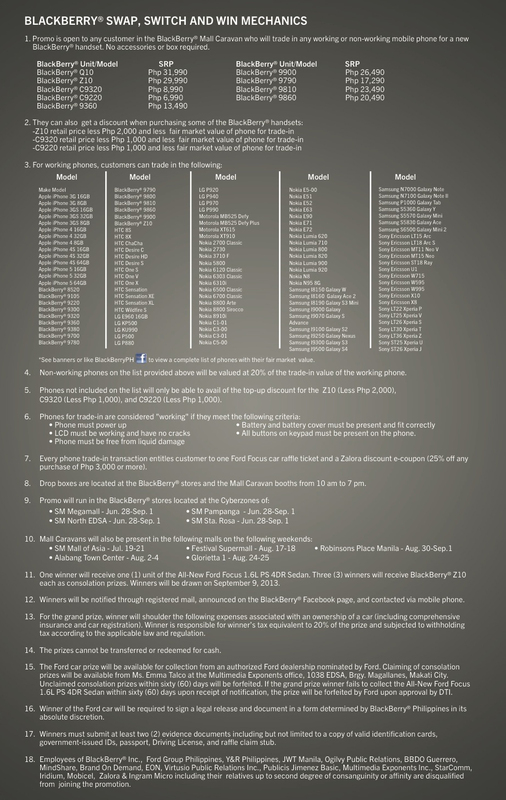 Check out the Swap and Switch page at www.facebook.com/BlackBerryPH to find a list of participating stores, estimate the trade-in value of their mobile phone, and learn more about their desired BlackBerry smartphone. To learn more about the Swap, Switch, and Win campaign as well as latest BlackBerry programs and offers, log on to www.facebook.com/BlackBerryPH or follow @BlackBerryPH on Twitter. Next article Twitter Queen Anne Curtis speaks up! Twitter Queen Anne Curtis speaks up!